For many of us, feelings of deficiency are right around the corner. It doesn&#8217;t take much--just hearing of someone else&#8217;s accomplishments, being criticized, getting into an argument, making a mistake at work--to make us feel that we are not okay. Beginning to understand how our lives have become ensnared in this trance of unworthiness is our first step toward reconnecting with who we really are and what it means to live fully. &#8220;Believing that something is wrong with us is a deep and tenacious suffering,&#8221; says Tara Brach at the start of this illuminating book. This suffering emerges in crippling self-judgments and conflicts in our relationships, in addictions and perfectionism, in loneliness and overwork--all the forces that keep our lives constricted and unfulfilled. Radical Acceptance offers a path to freedom, including the day-to-day practical guidance developed over Dr. Brach&#8217;s twenty years of work with therapy clients and Buddhist students. I've read a number of books on Buddhism, and many of them include a fair amount of discussion on "suffering" and how much of our pain is perpetuated by our telling stories to ourselves. The mind (and heart) is seemingly forever tangled in a web of doubt, what-ifs, and events that exist mostly or entirely in one's head. As Mark Twain put it, "My life has been full of terrible misfortunes, most of which never happened." That, in essence, is what /Radical Acceptance/ is about, but it goes above and beyond the seemingly brief gloss-over treatment traditional western Buddhist books give this subject. Tara Brach has crafted an amazing book that opens your eyes to just how much suffering we tend to bring upon ourselves. Despite the very serious nature of what this book deals with, it is a delight to read. With each turn of the page, you begin to see more and more clearly. It's like having a compassionate, age-old friend guide you down the road of your own emotions and thoughts. Not called "Radical" for nothing! Even though this book has Buddha in the subtitle, this book is the best of three worlds. Fundamentally, this is a book about awareness and awakening, which springs from a rich Buddhist tradition. However, it is also a book about the way awareness and awakening should be applied in the setting of therapy. Also, this is a book about the journey of the author, through her life, through her pain, to the fullness and divinity that is available in each moment. This makes the reading even more enjoyable and real. Finally and for me most importantly, this is a book about pain and how saying yes instead of saying no to our pain is the true path to freedom. Ms. Brach's approach is not to act out your pain, but to become fully aware of it. We only go through this life once. Tara Brach's book gives us the wisdom to make the most of what we have. In her writing, Tara discusses how to learn to live with whatever we have to face and to face it with acceptance, compassion and the full passion of life. The scope of her teaching admits to all the frailities of humankind while showing us how to bring love and compassion to ourselves. It is by starting with self acceptance that we can widen our acceptance to those we love and others. The book presents concepts that are easy to grasp - some of them are "aha!" - and offers concrete things we can do to move us along the path of radical acceptance. Tara Brach is a great teacher of psychology and an especially brilliant teacher of mindfulness, but I think her teachings of Buddhism are reductionist when it comes to their fundamental core. I concur with what many of the reviewers have said below about how well Tara Brach brings the Buddhist teachings on awareness and compassion to light. This book is particularly valuable for those who are interested in Buddhism as a collection of practical, secular techniques to improve personal well-being and social relationships. It is "accessible", "practical" and "heart-warming". In this sense Tara Brach is a master of human psychology. However, those who are interested in seeing what the Buddha saw (which is a possiblity for all), in living in such a way that it is no longer necessary to cultivate joy but merely have bliss follow one like a shadow, in realizing the formless compassion of the Buddhas which is beyond the limited techniques of psychology, should question some of the assertions in this book. The primary notion Tara Brach emphasizes which, while believable from a psychological perspective, is highly questionable from a Buddhist perspective, is the notion that "awareness is the true self" or "compassion is the true self". Tara Brach describes the true self as something one knows when one has the clear mind of meditation (whether seated or in daily life) or a compassionate heart, but doesn't know when one gets distracted or angry or self-doubting. In one passage, she describes being her true self one morning, getting distracted, and then losing touch with her true self. This makes it sound like the "true self" is some separate state, which is then defined with terms like awareness and compassion. There are many different interpretations of Buddhism and there is no way to objectively to say which is 'right' or 'authentic', but the view that the true self is something which comes in one state of mind and leaves in another is highly suspect. The "true self" in Buddhism, to the extent that one wishes to use such terminology, is altogether everywhere, without differentiation or degree. It neither comes nor goes nor sits nor reclines. One does not need to do any practice or be in any state to realize it; it cannot be with you sometimes and not with you other times. It depends on no state of mind, no practice, no virtue - it is unconditioned. All conditioned things (which includes the elements that we humans often mistakenly think we are such as our personalities or our virtues or our values or some profound mental/emotional state we come to) are intrinsically Nirvanic. In other words, confusion and anger are no less our "true self" than "awareness". Read this book, love it, cherish it, and learn from it, but ask yourself whether the real cessation of suffering the Buddha knew is some state of "awareness" or "compassion", something that is here when you are clear minded and gone when you are not. I don't think that's what the Buddha taught. But you can read the Majjhima Nikaya, available at Amazon, (Suttas 7, 10, 22, 26 are particularly relevant to this question) and find out for yourself. Awareness and compassion are very important, but the Buddha did not mistake them for a "true self". The Buddha rode on a raft of such positive states, such good karma, to cross to the other shore, but when he got there, he abandoned even them, he knew what was before and after them and what illuminates them beyond any faculty, and that is what allowed him to save thousands of beings with merely a word or a smile or a gesture. This book has had a very powerful effect on me. I quit reading spiritual books a year or so ago, and recently decided to step back in to reading a few. This was a very good choice. She communicates from her own humanity, letting me as the reader find myself in the text. Give yourself a chance, be honest to yourself and start healing. It's a wonderful book. The instructions are clear and easy. The hard part is to be loving towards oneself and stop the criticism. I am very thankful for this book. Buy it Read it Love it! In every day life we use too much time thinking and not enough time acting. This book wil help you with a remarkeble kindness. In the 25 centuries since the Buddha's enlightenment under the tree in northern India, his teachings have taken on unique expressions as they spread from India and throughout Asia. The core of the teachings kept their integrity and directness, but the forms and expressions they took both helped shape and were shaped by the cultures and pre-existing traditions in these countries. As the Buddha's teachings have spread to the West-particularly in the last two generations-a similarly fascinating encounter is at work. Westerners have the opportunity to read, explore, and practice in a variety of Buddhist traditions-Tibetan, Zen, Insight meditation and others. At the same time, Buddhism in the West is being shaped by our own social, political, cultural, and scientific history of recent centuries-so already Buddhism here looks less monastic, more gender equal, more focused on the inner search for truth than on external rites and rituals, and more agnostic on questions that are not so easily testable by our own direct experience, e.g., reincarnation. The spiritual marketplace is rich with the extraordinary contributions of Westerners who have spent extensive time in Asia studying with teachers there and coming back to share their wisdom-Jack Kornfield, Joseph Goldstein, Sharon Salzberg, Christopher Titmuss, to name just some of those teaching in the Insight meditation tradition. They have all succeeded in taking these perennial wisdom teachings and expressing them in a language that is accessible to Westerners from many walks of life and spiritual backgrounds. 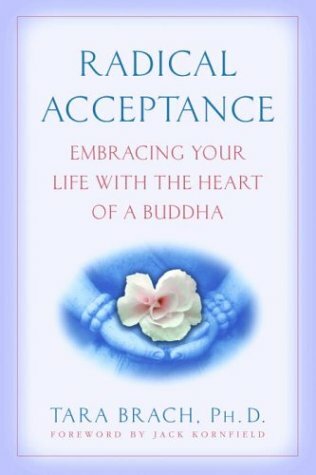 Tara Brach's `Radical Acceptance: Embracing your Life with the Heart of a Buddha' is a wonderful continuation of this still-new encounter. As a Buddhist meditation teacher and a psychotherapist, Brach is well placed to bring the wisdom and compassion of Buddhist teachings together with the insights and understandings of psychotherapy. But this is not a slam-dunk. Ancient wisdom teachings mixed with Western therapeutic approaches can come out as New Age pablum. Brach succeeds by staying true to the Buddha's statement: "I teach one thing and one thing alone: suffering and its end.' She finds much of our suffering in the West in our own lack of worth or worthiness and sees that happiness, contentment, and awakening must come through a full and loving acceptance of who we are-rather than trying to escape from, avoid, or transcend our fears, desire, and longings.